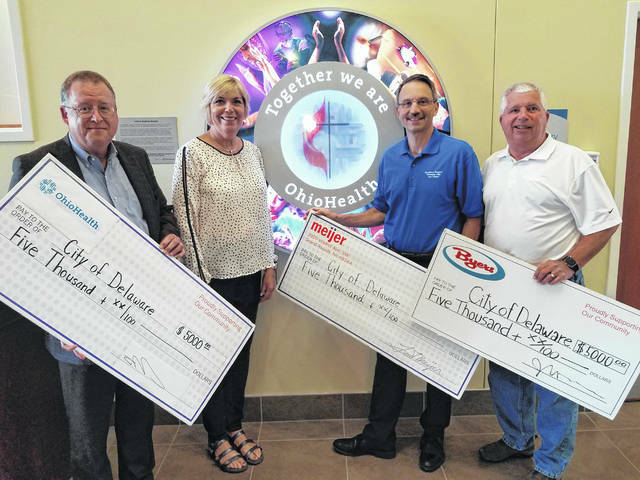 Pictured, left to right, in the OhioHealth Delaware Campus lobby are OhioHealth Dublin Methodist Hospital and OhioHealth Grady Memorial Hospital President Steve Bunyard, Delaware Mayor Carolyn Kay Riggle, Delaware Meijer Store Director Rod Cline and Byers Auto Group Vice President John DuRivage. Byers, Meijer and OhioHealth each renewed fireworks pledges – Byers as the Presenting Sponsor, Meijer as the Grand Finale Sponsor, and OhioHealth as the Community Spirit Sponsor. An estimated 30,000 spectators are expected downtown to view Delaware’s annual fireworks display Wednesday, July 4. The half-hour show will cap an Independence Day in Delaware that includes a parade and free outdoor concert. The City of Delaware sets a $25,000 fundraising goal each year for fireworks, while using city funds to pay for public safety and traffic control for the day’s activities. Ohio Wesleyan supports the events with public safety services and logistical help. Prior to fireworks, the Central Ohio Symphony will perform its traditional outdoor concert on the Ohio Wesleyan University campus beginning at 7:30 p.m. The day once again gets started with the annual parade, beginning at 3 p.m. and sponsored by Citizens for The 4th. Parade and concert information is available in the Calendar at delawareohio.net. The “City of Delaware Community Fund” for fireworks remains active. Tax-deductible contributions can be made to the fund, care of the Delaware County Foundation, 3954 N. Hampton Dr., Powell, 43065.